My Global Mind: Their new opus entitled Legacy is a brilliant spectacle morphing melodic progressive metal with stunning Arabic keyboard swaths and vocal melodies that hearken to the sounds of the Orient. From the albums opening “Jasmin” the listener is swept away by this grand, majestic sound that transports one to a different world. Myrath are one of the few bands that can legitimately create an authentic sound without sounding as if they’re trying to be anything other than themselves. With the brilliant guitar of original member Malek Ben Arbia soaring over the cinematic keyboard sounds of Elyes Bouchoucha, to the propulsive bass of Anis Jouini syncopating with the brilliant drums of Morgan Berthet; musically the band is not only totally unique within the songs but amazingly skilled as well. When you add the beautiful and emotional vocals of Zaher Zorgati whose voice goes from singing straight vocal lines to complex bits totally caps what makes Myrath one of the best bands you have not heard. There are standout performances by all involved, including the brilliant bass play of Anis Jouini, who is as distinct as any of the greats (check out his work at 2:00 on “Get Your Freedom Back”). Myrath has truly crafted something exceptional and the style is something I hope will stay composed by a select and unique few (Orphaned Land, Amadeus Awad and Amaseffer come to mind). An explosion of like acts will only serve to water down its value and stunning impact on the listener. “Legacy” is masterful in weaving the technical with cultural influences of the band and the production (handled by Adagio keyboardist Kevin Codfert) is top ​notch. Myrath has raised the bar and it’s going to be very interesting if anyone can catch up. Danger Dog Music: And it came to pass, after five years of touring many parts of the world with Dream Theater, Him, Orphaned Land, and Tarja, to both acclaim and success, Myrath returns with a new album, Legacy. They've never sounded better, more extravagant, more polished, more epic. And to think they wasted their early years being a death metal cover band. There's several things I want to point out about this album. But, perhaps the most important thing to say at the start is, buy this album. Seriously. Okay. Listen to the video if you must. Or read my feeble words. But, yeah, you should buy this album. It's that good. If you like their past work, you will love this one. Myrath's symphonic progressive power metal rocks. Put this on the short list for best prog metal album of the year. Nuff said. Now go buy the album. Quite recommended. The Metal Observer : Over the past few months, the world's eyes have been set on the Arab world, with breaths held in anticipation of the rapid political changes that are taking place. 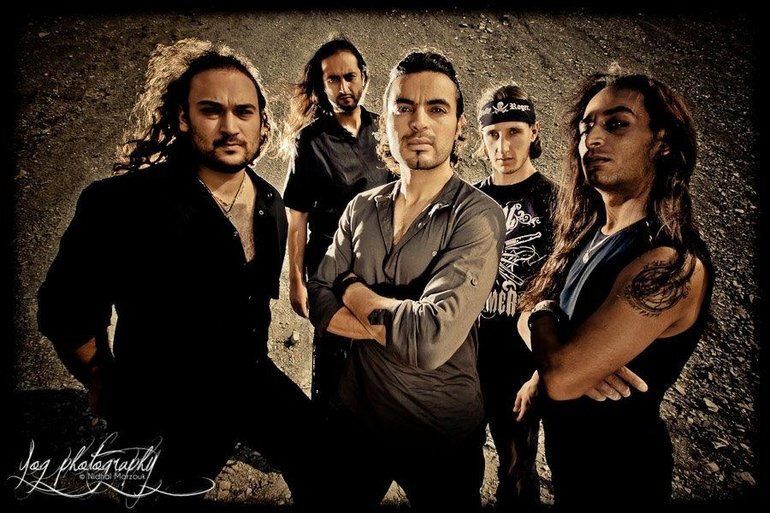 MYRATH is a Progressive outfit emerging from one of the region's smaller nations, Tunisia. 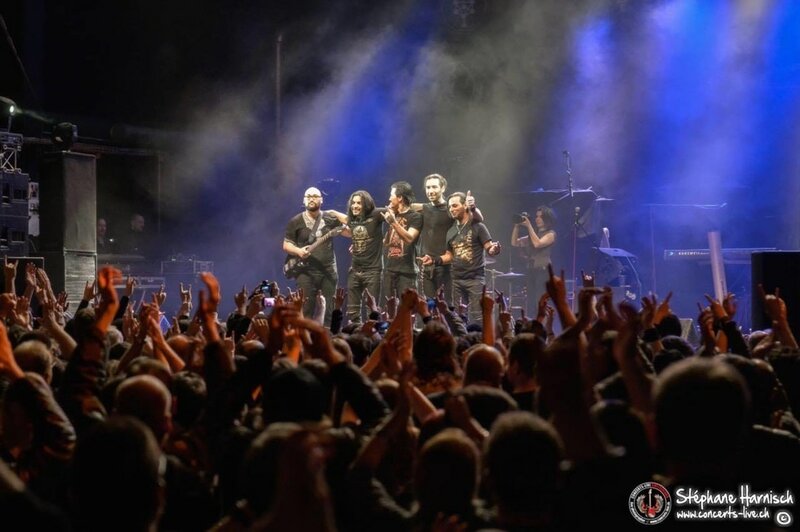 Being the first Metal band in the country to ever reach a wider audience, MYRATH (the Arabic word for “Legend”) have engaged audiences already with two albums of top-tier Progressive Metal, fusing Middle-Eastern traditional musical influences in with their brand of melodic Metal, much as the more established band ORPHANED LAND does. 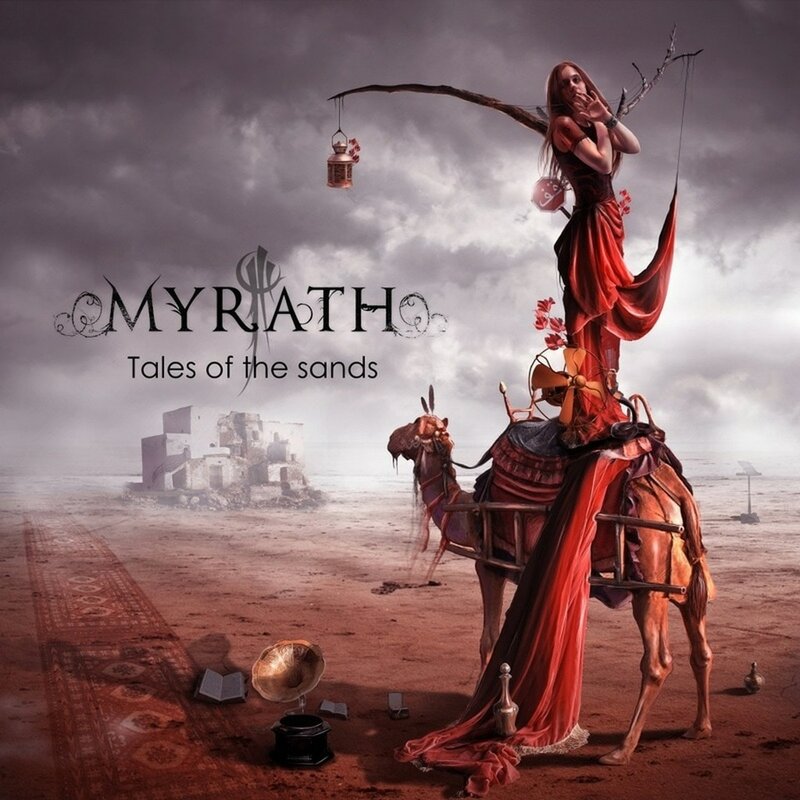 With a unique mixture of sound, excellent songwriting, and great execution, MYRATH's “Tales Of The Sands” is a fantastic album in its own right. Being someone who was under the impression that exciting melodic Prog Metal died around the turn of the millennium under a blanket of DREAM THEATER clones, it has been a huge refreshment to hear a band that may be doing something similar to the legends of the genre, but are putting a validating new angle on their sound. Before listening to what MYRATH had to offer, I was admittedly fighting a doubt that this could be a run-of-the-mill Power Metal band, using sounds of their homeland as a gimmick to pull in listeners, but as is fairly rare for my experience with Metal music, I was proven wrong. While Progressive Power Metal mixed with Arabic music sounds pretty much as one might expect, the Oriental sounds in the music are infused superbly in with the Metal, not sounding contrived, but instead as a sincere element of the songwriting. ​Prog Sphere: It’s blazing off with strong riffs and astounding solos (both guitar and keyboards), excellent vocals and symphonic passages, all the way from the opening Under Siege, down to the closing piece Apostrophe for a Legend. Thanks to bands who harbor such approach to progressive metal, the genre is still showing signs of life. In a year which brought us a completely average (and nothing more) Symphony X album, Myrath is bringing something new to table and embracing all those who once upon a time lost their faith in progressive metal. Stereo Killer : It's always great when a band unknown to you ends up surpassing any expectations. Myrath did more than that. Being a fan of the prog and power metal genres, it's always nice to hear a band add new twists to it rather than simply aping early Dream Theater releases. It's not to say the band doesn't draw some influence from Dream Theater. They also draw from Symphony X. It's the oriental rhythms and melodies that really set the band apart from their peers. The band mixes them in seamlessly and never sound forced as if an afterthought. The musicianship is flawlessly executed. An album such as this needs excellent production and it comes through in aces. The recording is huge sounding with the perfect amount of polish. This is especially true on the drum sounds they obtained. Tales of the Sands left me thoroughly satisfied. The release also left me wondering why this is the first I'm hearing of them. A band this strong deserves a lot more notice. The Metal Report : This is the sound of the sand transcribed into the language of metal. As soon as the first track starts and you hear the melancholic singing of a woman; the synths come and and finally the guitars transport you to a world of traditional power metal combined with Arabian atmosphere. When the rest of the album wraps around you like a dust storm in the desert you are hooked. This album is fun, it's progressive and it's simply good. The best aspects of the album are the way that they integrate traditional Arabic oriental sounds with modern power metal riffs; the sparingly but excellent use of synth's and strings; and the lead singers varied and beautiful vocals. These three aspects really work together in concert to create what makes this band so unique and special. Rock n World: "Tales of the Sands" imposes a stern balance between fundamental progressive metal rooted deeply in algebraic rhythms and a degree of technicality which shines with substantial similarities to Dream Theater and especially Symphony X (their main influence, and it shows) while incorporating a number of Arabic instruments and melodies at each turn of the sand's tide. The band weaves through a number of standard prog-inspired riffs that have hints of classic, old-school metal and little dabs of progressive rock in the vein of Rush, but keyboards and active percussion are incredibly prominent in their ideology as well; while not original or unusual, the chops are tight, efficient, and well-calculated considering Myrath's texture. One quality that sticks is the unpredictable change of tempos that this band undergoes. Each song moves at its own pace, with some demonstrating a mid-paced, chorus-based frontier, yet others bend and weave through an electric journey of hyper projections which flash Arabic melodies and touches at head-banging velocities.